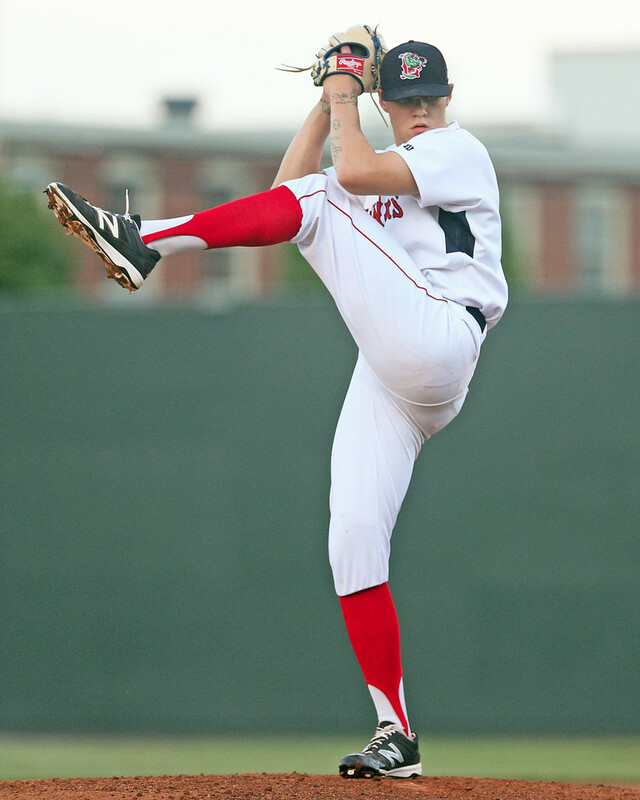 First-round selection Tanner Houck (pictured) made his minor league debut for the Lowell Spinners on Monday night. The right-hander from Missouri threw one inning, allowing three runs (two earned) with two strikeouts and a walk. SoxProspects.com Director of Scouting Ian Cundall attended the game and had some positive notes despite Houck's shaky performance. After Tuesday's scheduled starting pitcher, Doug Fister, threw 2 2/3 innings of relief in Saturday's 16-inning loss, the Red Sox were forced to shuffle their roster this week. The Red Sox optioned left-hander Robby Scott, who had pitched to a 3.75 ERA in 24 innings with Boston, to Pawtucket and recalled Brian Johnson to make the start. In a move to add some additional bullpen depth (which was ultimately necessary due to a 15-inning marathon on Tuesday), Boston also recalled Hector Velazquez and optioned first baseman Sam Travis to Pawtucket. Travis, who lands third in the SoxProspects.com rankings, has hit .279/.380/.395 in 50 major league plate appearances. Johnson got the job done for the Red Sox on Tuesday, battling through six innings and allowing three runs. He gave up eight hits and three walks, punching out four. The 13th-ranked prospect in the system now has a 4.33 ERA in 27 innings with Boston this season. He has been more impressive in Pawtucket, where the 26-year old has a 2.68 ERA in 57 innings. After that 15-inning affair on Tuesday, the Red Sox stayed busy with more roster moves on Wednesday. They optioned Johnson and Velazquez, who tossed four shutout innings of relief and earned the win, to Pawtucket. In a pair of corresponding moves, they brought relief pitchers Ben Taylor and Kyle Martin up to Boston. Taylor has a 6.14 ERA in 14 2/3 innings with the Red Sox and has pitched to a 3.86 ERA in 9 1/3 frames with the PawSox. Martin has a 3.79 ERA in 38 innings with the PawSox and this marks his first major league stint. In the 126th episode of the SoxProspects.com Podcast, Executive Editor Chris Hatfield and Director of Scouting Ian Cundall discuss Rafael Devers' promotion to Pawtucket, the new rankings, and Red Sox trade rumors. Left-hander and former first-round pick Trey Ball was featured on the Scouting Scratch on Wednesday. Ian witnessed one of Ball's best starts this season but inconsistency remains the book on Ball, who now holds a 5.42 ERA in Portland. Top prospect Rafael Devers is still settling into his first week in Pawtucket, but the possibility of a promotion to Boston looms in the near future. Third base has been a black hole for the Red Sox this season and Devers notes that the team's lack of production at the hot corner does motivate him. In a surprise to nobody, the Red Sox are telling teams that Devers in unavailable in trades. It's clear that Devers is the team's future as the 20-year old ranks as one of the top prospects in all of baseball and is 8 for 19 with two home runs in his first five games for Pawtucket. This season has marked another lost year for Blake Swihart thus far. Ankle soreness has hampered his ability to catch on a regular basis and he has hit only .213/.265/.327 in Pawtucket when he has played. Swihart is attempting to salvage his season by adding some versatility and he is taking ground balls at first and third base. To take a brief look outside of the Red Sox organization, the Chicago White Sox have promoted former Red Sox top prospect Yoan Moncada to the majors. The 22-year old Moncada has performed well with Triple-A Charlotte, slashing .282/.377/.447 with 12 home runs and 17 stolen bases. Moncada, of course, was traded to Chicago along with Michael Kopech, Luis Alexander Basabe, and Victor Diaz in exchange for Chris Sale last December.